ArrowCreek Home Owner Association (ACHOA) initiatives are underway to enhance sales and values (a most positive step given the latest values). The initiatives include a Landscape Committee, which is looking into improving the water quality around our parkway to enhance the ‘greening’ of plantings, and a strategic planning initiative, which has yielded a concept that has received rave reviews. These initiatives are intended to enhance and maintain ArrowCreek as a premier people and family oriented community collocated with a private golf club, identified as a Non-Residential area in the governing documents. 1. ArrowCreek properties properties have stayed in the premium class within Washoe and Douglas Counties. As you read this report you will see that prices have improved for properties on the golf course, with an average appreciation rate of 15.4% over this past year, while prices for homes not on the golf course have increased by 5.4% over the same period. With eleven properties in eight different neighborhoods changing hands this past month, the “hottest” neighborhood was Painted Vista. a.) Eleven (11) properties were recorded sold in ArrowCreek between 19 March and 9 April 2018 (per the Washoe County Assessor, who appears to be running late as the data was extracted on 24 April and the last ‘sale’ recorded was 9 April). This brings the total number of properties transferred over the past rolling year to 96 or 8.8% turn-over rate for our community. This remains a relatively low rate, still in the single digits, that may be attributed to a general satisfaction with living in our gated community or a positive perspective on our amenities and an emphasis on the secure stable environment offered within ArrowCreek. b.) One (1) property on the golf course (where the property boundaries actually touch the golf course, not just have a ‘view’ of it) was closed during this reporting period. The rolling average selling price for homes on the golf course now stands at $293.13 per square foot. This is an increase of $2.58 per square foot from March’s value, based solely upon the statistical rolling average calculation. The 12-month rolling average sales price increased to $1,151,653.85, again based upon statistical methods. No additional lots on the course were sold. The rolling average selling price for undeveloped property on the golf course still stands at $256,714.02 per acre. c.) Ten (10) properties were sold that are not connected to the golf course. The rolling average selling price for off course homes increased to $259.86 per square foot, which is up by $4.82 per square foot. The twelve-month rolling average sales price increased to $878,736.91. Two (2) additional lots were sold during this reporting period. The rolling 12-month average selling price for vacant land, not on the golf course, stands 9.7% below vacant golf course property at $234,050.67 per acre. d.) The figure below shows the value trends over the past twelve months with the vertical scale being cost per square-foot. 2. The housing market in Northern Nevada for existing homes continues to follow economic trends. We continue to see a boost to our unique community with the Spring selling season underway. Do keep in mind that everyone’s selling price is based upon their own set of circumstances and the above picture is hindsight, not necessarily foresight. However, it is very clear that some market driven change in the perception of our 21 community neighborhoods occurred in the May/June 2017 time period, to the benefit of some and detriment of others. A balanced marketing approach focused on improving the amenities we currently have and build out those that were in the original ArrowCreek/Southwest Pointe development plan, by using our already available acreage and funding. With that we should see a better environment for all home owners and buyers. Reno market ‘in general’ – Custom homes in Reno are selling, on average, for $264.16 per square-foot (Median price $1,093,875) with an average of 194 days on the market. As noted above, you can see our ArrowCreek comparable custom homes are selling $22-76 per square-foot higher. Data for separate ArrowCreek average time on market was not available. Reno homes comparable to ArrowCreek semi-custom homes are selling for $200.52 per square-foot (Median price $534,975) with a time on market of 68 days. Again, ArrowCreek semi-custom home averages are around $38 higher per square foot. Median prices rose across the Reno market by 7.9% during the comparable past year while ArrowCreek combined median prices were only 6.1% higher. 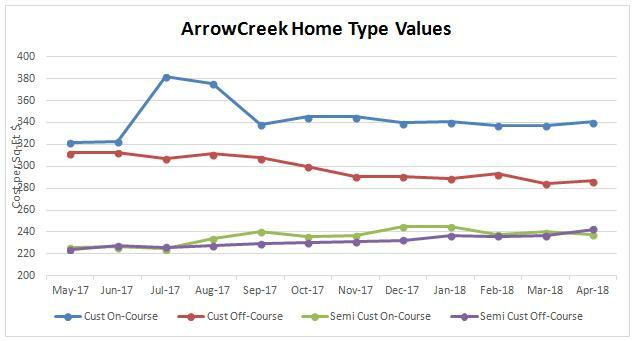 Perhaps the increase in value was not as fast in ArrowCreek because the homes are already higher values in the first place. Sparks market ‘in general’ – The top quartile in the Sparks market actually compares with the semi-custom homes in ArrowCreek. The medium price for these Sparks homes is $184.92 per square-foot (Median price $559,000) with an average of 82 days on the market. Median prices rose across this market by 12.3% during the comparable past year. For the ArrowCreek community, the semi-custom homes only rose 6.1%. Commentary: ArrowCreek homes are definitely in the top two quartiles of Reno and the semi-custom homes are in the top quartile of Sparks. The ‘value proposition’ for our unique community should continue to focus on professionals who value security, good schools and recreational opportunities. More people will come to the ArrowCreek ‘experience’ as Nevada businesses gather top talent with competitive salaries. This entry was posted in ArrowCreek, ArrowCreek 411, ArrowCreek411, D’Andrea, Home Sales, Home Values, Land Re-Use, Land Use, Land Value Study, Property Value, Real Estate Value, Reno, Somersett, Sparks, Truth and tagged AC411, ACHOA, ArrowCreek, ArrowCreek 411, ArrowCreek home values, ArrowCreek411, D’Andrea, Golf, Golf Course, HOA, Home Sales, Home Values, Homeowner Association, Homeowners Association, Land Re-Use, Land Use, land value, land value study, property value, Somersett, Truth, Washoe County, Washoe County Assessor Records, Washoe County Property Assessments. Bookmark the permalink.